Before there were folk singers like Pete Seeger and Woody Guthrie, there was “The Kentucky Mountain Boy”, Bradley Kincaid (who performs under a pseudonym on this disc). Equally comfortable in hillbilly attire as with round framed spectacles, tidy hair, and pressed suits, Kincaid was of a decidedly more sophisticated mold than many of the more “hillbilly” folk singers of his day, while still not succumbing to the urbanity that has in some eyes damaged the credibility of such performers as Vernon Dalhart. Bradley Kincaid was born in Point Level, Kentucky on July 13, 1895 and made his radio debut on Chicago’s WLS National Barn Dance in 1926 and later became a member of the Grand Ole Opry on WSM in Nashville in 1945. After a long and successful career which included giving future Grand Ole Opry star Marshall Jones the nickname “Grandpa” while working with him at a Boston radio station in 1935, Kincaid died following injuries sustained in a car accident at the ripe old age of 94 on September 23, 1989. Champion 15687 was recorded January 28, 1929 in Richmond, Indiana by Bradley Kincaid, given the nom de disque “Dan Hughey” on this release. It was also issued on Gennett 6761 and Supertone 9362, and later reissued on Champion 45057 by Decca. The “A” side also appeared on Superior 2656. One of the great classic American folk songs, Kincaid first sings “Four Thousand Years Ago”, called “The Highly Educated Man” by John A. Lomax in his American Ballads and Folk Songs. 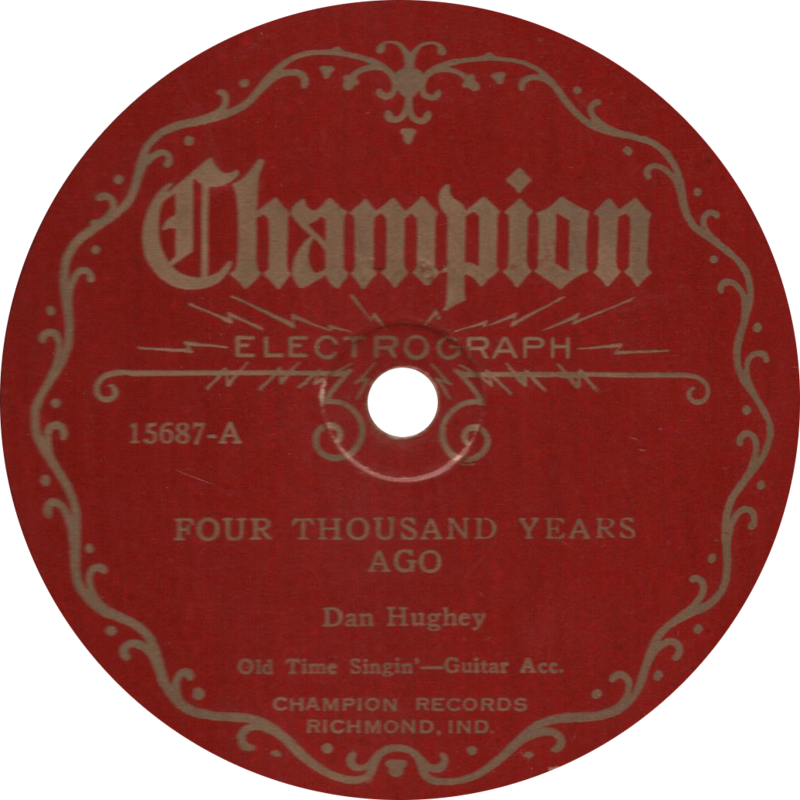 Four Thousand Years Ago, recorded January 28, 1929 by Dan Hughey. On the reverse, Kincaid sings “Liza Up In the ‘Simmon Tree”. This is one of those folk songs that bears great lyrical similarity to other songs; for example, “shoes and stockings in her hand and her feet all over the floor” can be heard in Wendell Hall’s “It Ain’t Gonna Rain No Mo'”, and “well, I wouldn’t marry a poor girl, I’ll tell you the reason why…” is similar to the lyrics of “Chewing Gum”, as sung by the Carter Family. 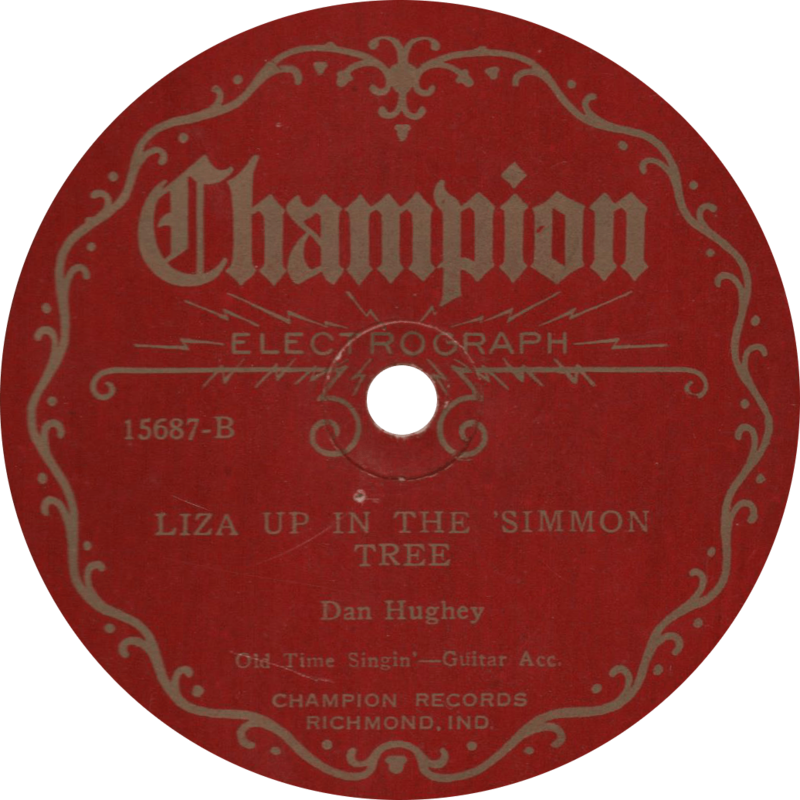 Liza Up in the ‘Simmon Tree, recorded January 28, 1929 by Dan Hughey. Updated on June 15, 2017. This entry was posted in Records and tagged 1920s, 1929, Bradley Kincaid, Champion, Folk, Hillbilly, Richmond, Starr Piano Co., WLS National Barn Dance by R. Connor Montgomery. Bookmark the permalink.